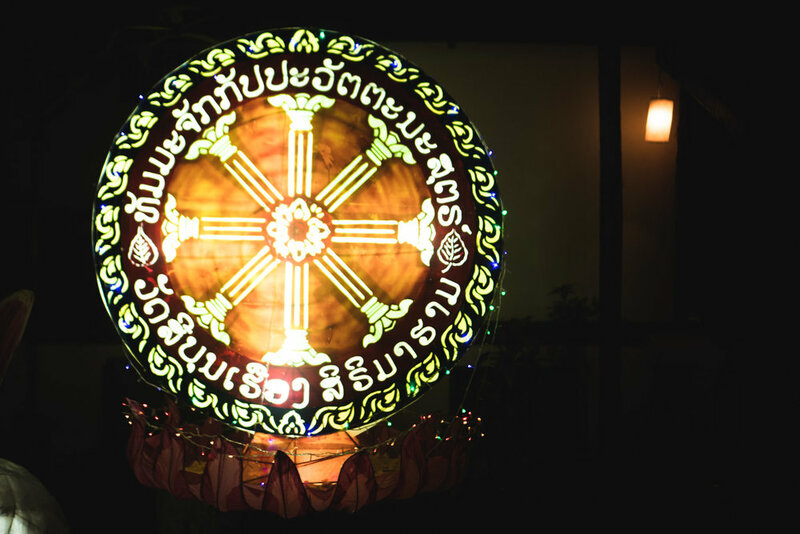 Lucky enough, my short stint in Luang Prabang coincided with one very magical festival known locally as “Bun Ok Pansa” or the Festival of Lights. Ever since I arrived in late August, locals I met told me that I was fortunate to be here for the full moon in October. And since my first day at Ock Pop Tok, staff were constructing handmade bamboo star lanterns in preparation for the festivities that were still two months away. It all sounded quite exciting, yet I don’t think I fully understood what was to come. As we entered the first couple weeks of October, I began to see Buddhist monks in the temple gardens working around the clock creating paper lanterns and sculptures. Luang Prabang’s charming downtown began to transform after sunset, all the shop fronts, restaurants and boutique hotels illuminated with colorful star-shaped lanterns and decorations. More and more roadside stands popped up selling lanterns, candles and other decorations. So, what is this celebration all about? The Bun Ok Pansa (other names include Lai Heua Fai or La Kathong) celebration marks the end of Buddhist “Vassa.“ After three months in rainy season retreat restricted to their temples studying dharma and meditating, Buddhist monks and practitioners once again return to their social duties. 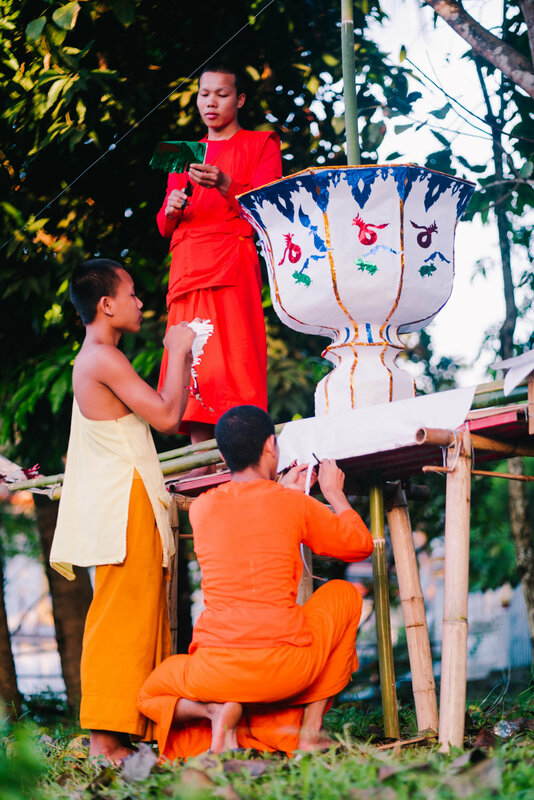 On the full moon of the 11th month of the Lao Buddhist calendar, Luang Prabang celebrates in full form. In the weeks leading up to the day, neighborhoods or “bans” come together to construct elaborate bamboo and paper boats in the shape of important mythical creatures, predominately the phaya naga (mythical serpent) or hongsa (mythical swan). Every temple or ”wat” is magically illuminated, reminiscent of a very festive neighborhood during Christmas. On the night of the full moon, all the bans (51 this year!) parade in procession down the main road with candle bearers in traditional dress, dancers, singers, musicians and fireworks. They parade to Wat Xiengthong at the end of the peninsula to be judged for their construction and beauty by local officials and leaders. Then they are one by one released onto the Mekong River. The whole town, locals and tourists alike, meet in the streets to be dazzled by the endless display of light and thoughtful craftsmanship. I was lucky enough to get the the tip to watch the festivities from a boat on the Mekong and I couldn’t have a imagined a more unbelievable scene. 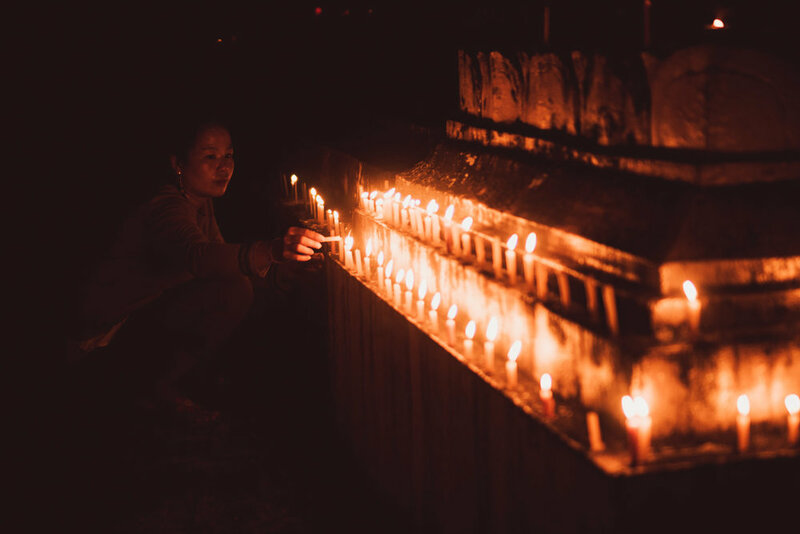 Both sides of the river were covered in the warm glow of candles and the water swirled with the constant flow of little Kathongs floating down river. On the river bank, the boats were launched in a steady stream, their handlers silhouetted by candle-light as they steadied the boats standing on precarious rafts. If you looked in any direction, you were welcomed by a beautiful moment of people coming together, whether it was a mom helping her child release a kathong or friends cheersing Beer Lao on riverside patios. 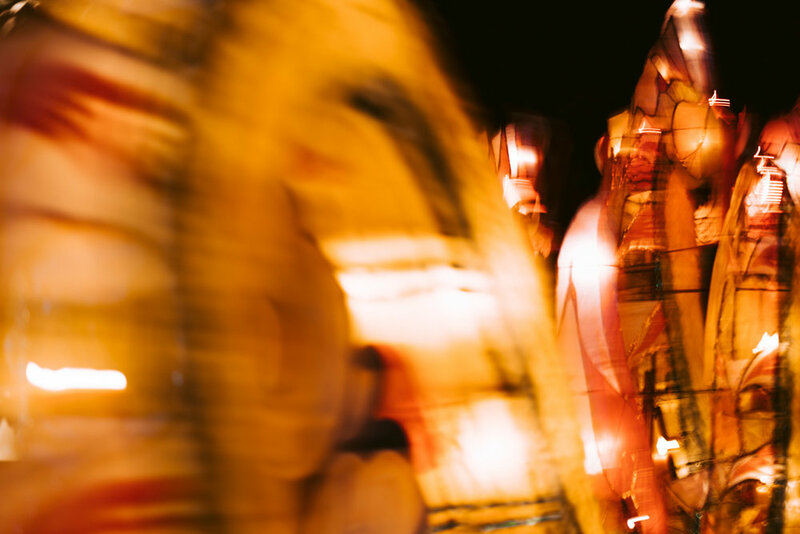 After experiencing the festival for the first time and investigating its significance, I have a new appreciation for it even beyond the awe-inspiring decorations and lively festivities. Bon Ok Pansa is an invitation to pause and reflect on the past, letting it go to make space for positivity and welcome new things to come in the future. The time and intention put into every bamboo star lantern and every naga boat reminds me of the role of a zen sand garden plays in Zen Buddhism. Working with paper and natural materials means that these beautiful decorations will eventually deteriorate or be quickly ruined by an unexpected rainstorm. But the mentality is to accept what is beyond our control and to simply begin again, together. If you ever get a chance to visit Luang Prabang for Bun Ok Pansa, you will certainly not regret it.